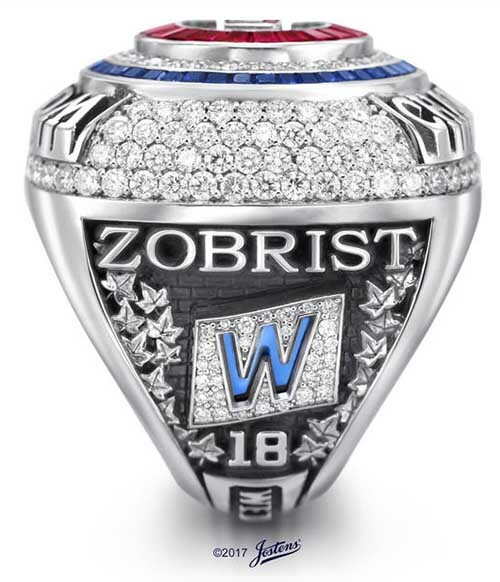 You can say that the Chicago Cubs' 2016 World Series rings were 108 years in the making. That's because the last time the Cubs won baseball's Fall Classic — in 1908 — the average wage was 22 cents per hour, 8% of homes had a telephone and the White House was occupied by President Theodore Roosevelt. Fittingly, ring manufacturer Jostens loaded the 14-karat white gold bling with a slew of symbolic elements, including 108 diamonds surrounding the bezel on all sides. Overall, the rings boast 5.5 carats of diamonds, 3 carats of genuine Burmese rubies and 2.5 carats of genuine sapphires in a handsome red, white and blue design. 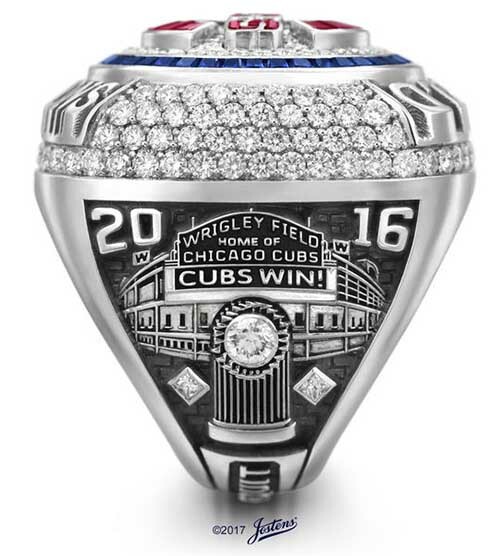 The face of the ring features the familiar Cubs' bullseye logo masterfully rendered in 33 custom-cut rubies set in a ground of 72 round white diamonds and surrounded by a circular frame made from 46 custom-cut blue sapphires. 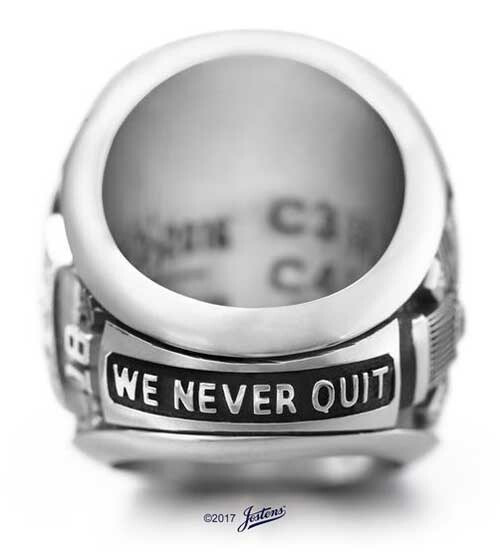 The words WORLD and CHAMPIONS in raised white gold letters against a black ground wrap the top and bottom edges of the ring. The Cubs have a tradition of flying a victory flag at Wrigley Field every time the team wins. That symbol, carved from fire blue corundum and surrounded by 31 white diamonds, sits below the player's name and above the player's number on one side of the ring. The iconic Wrigley Field bricks and ivy complete the background. On the ring's opposite side is a silhouette of the Wrigley Field façade, the championship year and a marquee displaying the message "CUBS WIN!" Also shown is a silhouette of the World Series trophy with a large round white diamond set in the center signifying the 2016 World Series victory. On each side of the trophy is a princess-cut diamond representing the team's two previous World Series titles — in 1907 and 1908. Hidden on the inside of the bottom of the band is the symbol of a goat's head, which is a nod to the "Curse of the Billy Goat." Cubs legend states that the curse was placed on the franchise by William Sianis, the owner of the Billy Goat Tavern, in 1945. Sianis had attended a World Series game at Wrigley Field with his pet goat and fans complained of the odor. When Sianis was asked to leave, he allegedly declared, "Them Cubs, the ain't gonna win no more." The "curse" lasted for 71 years. 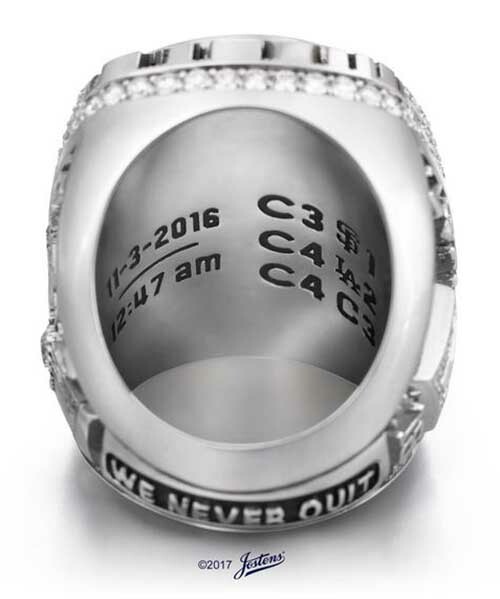 The inside of the band also displays the date and time of the championship – 11/3/16 • 12:47 AM EST – and the series scores and logos of the three teams the Cubs defeated on their way to the World Series victory. The Cubs defeated the Cleveland Indians in seven games after coming back from a 3-1 deficit. The final game went into extra innings, but the Cubs prevailed 8-7. 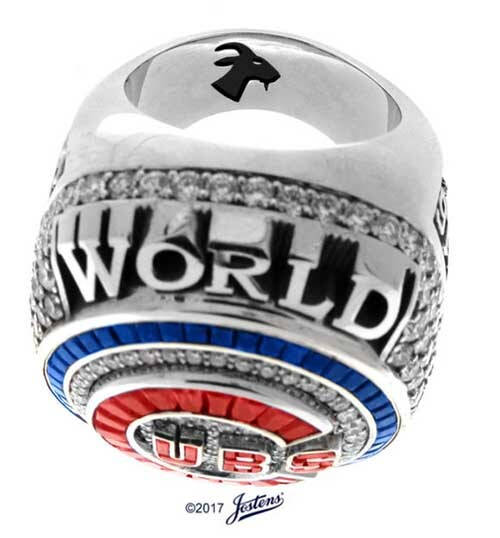 "We felt that we had a responsibility, not only to the Cubs organization, but to Cubs fans around the world, to create a once-in-a-lifetime ring," said Chris Poitras, Jostens Division Vice President, College & Sports. 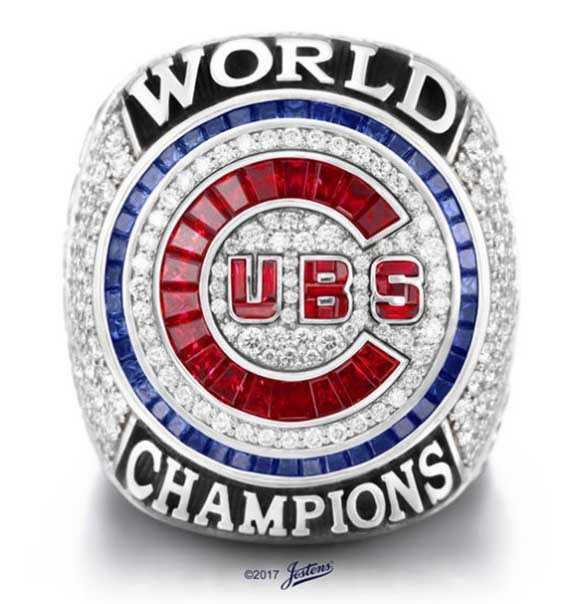 "This iconic piece of jewelry uses intricate craftsmanship to tell the unforgettable story of the Cubs' World Series victory, which now takes its prominent place in the history of all professional sports." Credits: Images courtesy of Jostens.